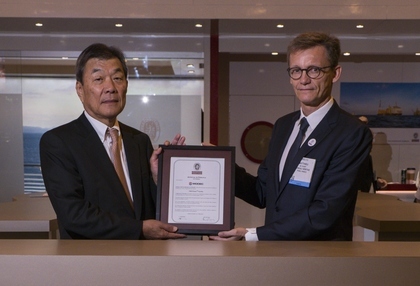 Floating, Storage, Regasification, Water-desalination and Power generation (FSRWP®) vessel concept has been developed by MODEC to address global key water and energy needs from a floating platform Approval in Principle (AiP) was formally recognized in a ceremony at OTC 2018. Paris-La Défense, France, May 02, – Bureau Veritas, a global leader in testing, inspection and certification (TIC) services, has awarded Approval in Principal (AiP) to a new vessel concept design that could provide clean power and water more efficiently and cost-effectively than conventional solutions. 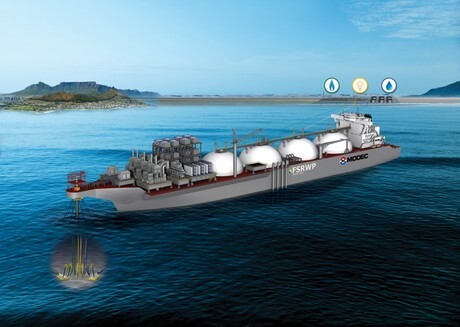 MODEC , the global supplier and operator of offshore floating production platforms , has developed the Floating Storage, Regasification, Water-Desalination and Power-Generation (FSRWP®) vessel, which can provide clean energy and water faster and cheaper than current solutions. As a new concept, the design is not covered by existing classification society rules but, working alongside Bureau Veritas, with its global presence, including a strong network in Africa, a key potential geographical area for FSRWP® deployment, the two international businesses worked together to find a solution. *FSRWP is registered trademarks of MODEC. Bureau Veritas used its expertise to develop new approaches to classification for this vessel, based on risk mitigation around new technology and requirements. The outcome has been that Bureau Veritas has awarded Approval in Principal to the new FSRWP® vessel. Founded in 1968, MODEC has been providing competitive floating solutions for the offshore oil and gas industry and is recognized as a leading specialist for Floating Production Storage and Offloading (FPSO) vessels, Floating Storage and Offloading (FSO) vessels, Floating LNGs (FLNGs), Tension Leg Platforms (TLPs), Production Semi-submersibles and Mobile Offshore Production Units (MOPUs). MODEC has an excellent track record of EPCI (Engineering, Procurement, Construction and Installation) as well as charter and operations projects, so far delivered 44 floating production systems and currently owns 12 FPSOs and 3 FSOs and operates 18 units. With over 200 years of accumulated Operation & Maintenance (O&M) term on nearly 30 floating production units, MODEC is able to use the valuable knowledge gained through O&M experience to improve our EPCI projects and Operational Services. Bureau Veritas is a world leader in laboratory testing, inspection and certification services. Created in 1828, the Group has about 74,000 employees in over 1,400 offices and laboratories located all across the globe. Bureau Veritas helps its clients to improve their performance by offering services and innovative solutions in order to ensure that their assets, products, infrastructure and processes meet standards and regulations in terms of quality, health and safety, environmental protection and social responsibility. Bureau Veritas is listed on Euronext Paris and belongs to the Next 20 index.